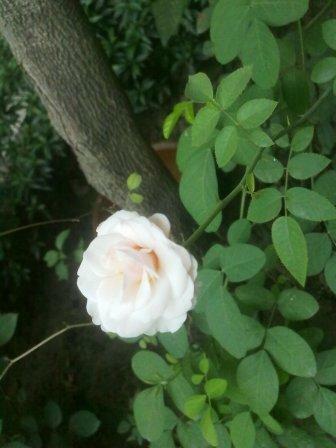 The white rose that greets me outside my flat almost daily flowers for a day or two, then begins to wither. I've been watching this trend keenly: another splash of brilliance on some other branch takes over almost immediately, but two roses don't bloom together on the bush. I wrote earlier about the rose bush that my former neighbour had planted outside my flat. 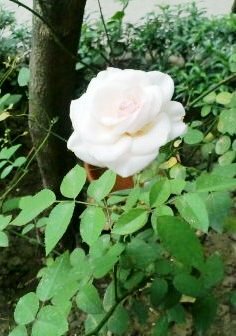 One rose only at a time, and truly it remains that way. The young man to whom she has let out her flat loves to potter about morning and evening amid the limited greenery our apartments can afford. It's great to see his little daughter faithfully by his side, when she's not away to school. He's the one who makes sure the plants outside our flats are watered regularly, and has even managed an impossible feat. 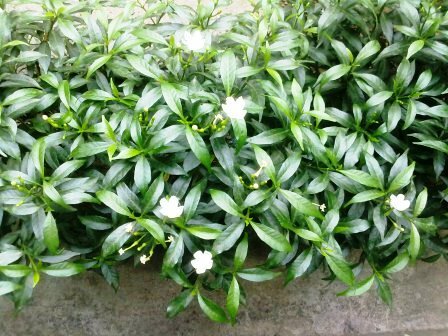 He's nudged the unyielding earth outside my flat into letting him grow a beautiful little hedge dotted with cute local jasmines (below, left) that make my day each time I go out walking. It worries me less now that the flower beds outside his flat bloom much more. The pink heart tugs at yours. At times I feel guilty about my non-participation in an exercise that brings such a feast for the eyes. 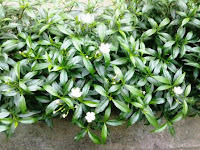 But I'm sure my neighbour's so happy to tend to the green ones around us that maybe he's best left alone with them. I can just thank him heartily whenever I see him. The toughest must give way to flowers. 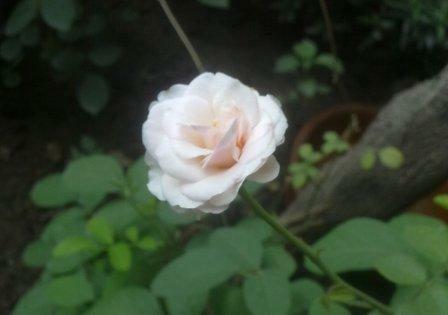 In the pictures of the roses taken over a week, note that each flower looks like a marvellous clone of the other two. The white is almost blinding, and the touch of pink just does you in. Yes, the roses dazzle in the morning; by the evening, like all else they begin to droop in the searing May heat. That's the sixth in my Nature series. Thanks, Vineet! Yes indeed all the pix on this blog so far I've clicked with my phone camera.